If you are thinking about purchasing a new mattress, you might be asking yourself what options do I have. With all the various types available these days, finding the perfect one that suits your needs might actually be a daunting task. Two of the most popular options are the latex and the spring models (also known as innerspring models). Keep in mind that these two have very different properties. Most people are used to having the traditional coil model, but it might actually be a good opportunity to take advantage of a latex option. Either way, it is still critical that before investing in a good, reliable product, you need to know the basics of a latex versus a spring option. A latex model, as its name implies, is made of a specific kind of material: latex. You cannot find any coils or springs in it. So what is it? Basically, it a natural and eco friendly product obtained from the sap of rubber trees. The sap is then processed to create mattress blocks. These blocks have natural springiness, thus providing good spinal support. Therefore, they give you that soft yet very supportive feel. A latex model provides natural bounciness, without the springs or coils. 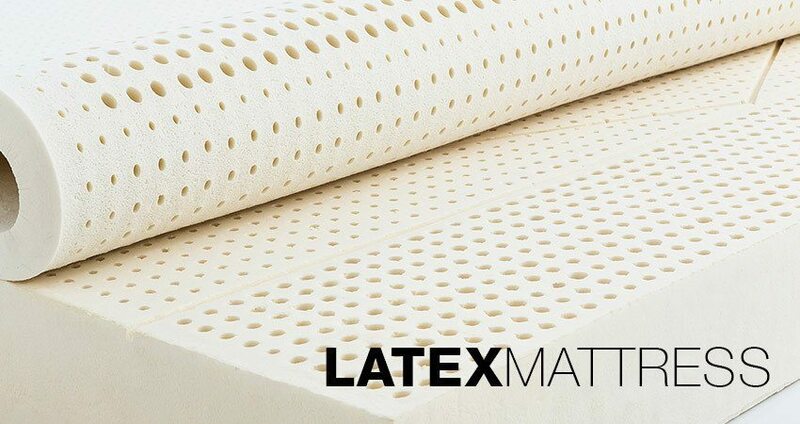 Because latex is highly breathable due to its natural open cell structure, these types of mattresses are ideal for places with warm and humid climates. Plus, they contain pinholes in them that further enhance natural airflow. Latex models are also dust-mite and mold resistant without the aid of additional forms of chemicals. In contrast, spring models often include specific chemicals for these sole purposes. They are relatively more expensive than spring models. However, that doesn’t seem to be an issue considering they are very durable and will last a long time. They have been proven to retain their comfort and softness over a long period of time without the worry of sagging. A spring coil model, also called an innerspring mattress, or a hybrid coil, is made up of metal coils that are surrounded by soft and supportive foams. The main purpose of these coils is to provide that bouncy feel while maintaining the softness and comfort that a foam model provides. These models differ from one another in terms of the number of coils used which affects the comfort. Some use micro coils, some use individual coils encased in a “pocket” of fabric – also known as a pocketed coil mattress – which helps evenly distribute weight and also enable the creation of different support zones. There are also other factors that determine how cozy a spring coil model is. These factors include the coil sizes, the metal gauge from which these coils are made, the foam padding thickness, and a lot more. When lying down on a latex model, the first thing you will notice is a feeling of being supported yet not sinking down into the mattress like you would a memory foam option. Some call this sensation “sleeping on” vs. “sleeping in” your mattress, and is often a personal preference. Latex options are also good for those suffering from chronic back pain. The combination of cushion, yet firmness, can greatly help relieve pain. 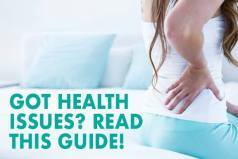 Moreover, medical professionals often recommend these mattresses for its capacity to help align the spine and support body comfortably and properly. As with innerspring mattresses, upon lying down, you can feel your body being supported on the top portion of the mattress. However, you won’t get that soft-sinking feeling that you usually get when you lie upon a latex model. If they work well for you, just be sure that you choose those that are well-made and have good quality. That way, you won’t end up feeling the springs that are inside the mattress when you lie down. Be aware that as these mattresses age, their foam layers will start to show signs of wear and tear. The foam layer on top of this type of mattress tend to break down. As a result, with some traditional coil mattresses, you may end up feeling the spring coils poking you as you lie in bed. This is quite uncomfortable especially for the not-so-well-manufactured innerspring model. Exceptional comfort – They perform over and above any other types of mattresses in the industry. Both the supportiveness and the soft comfort of the latex material are proven to lessen chronic back pain. Movement Isolation – They do not easily transmit movement. Meaning, if your bed mate rolls over to one side, you won’t end up rolling over to his side as well. Natural – Because latex is generally a natural product, models made from this material do not contain any form of harsh chemicals. Naturally mold and dust mite resistant – No chemicals are required to keep the mattresses away from these common problems. Sleeps cool – Latex is breathable, thanks to its open cell structure; thus, superb air circulation is very reachable. Plus, the pinholes strategically inserted around the mattress allow airflow much better than any other type. Longevity – They are highly durable and can last longer. Orthopedic Benefits – These mattresses provide great pressure relief thanks to excellent body pressure points. 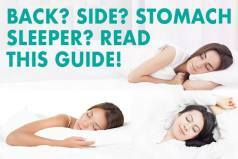 When sleeping, your spine is properly aligned. Low-priced – They start at relatively low prices. However, the high-end hybrid coil mattresses can be just as costly as other types of mattresses. Easy-to-find – Because spring mattresses are considered the most popular type, you won’t have a hard time finding a suitable one to try. Lightweight – In general, the weight of a spring mattress can vary, depending on the materials and construction. But the basic ones are moderately light-weight, thus, allowing you to easily turn them when necessary. Wide Range of Options – Because of its popularity, you can find a huge array of spring model with different firmness levels. 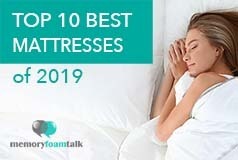 Expensive – They, and especially 100% natural latex models are generally going to be a lot more expensive as compared with other types of mattresses. Heavy – Because they are made from 100% latex, these mattresses are much heavier than conventional innerspring models. Short lifetime – In most cases, the layer that tears down rather quickly in a spring model is its top comfort layer. When this happens, the feeling of the springs poking you underneath is a potential risk. Also, one reason why a spring model has a shorter lifespan is because it slowly sags over time. This will result in sleeping discomfort. Metal coils pose antenna risk – If you are bothered about electromagnetic radiations, then you must stay away from spring models. Accordingly, the metal coils in these mattresses act as antennas and can amplify ambient electromagnetic radiations. Noisy Springs – It is common to hear noises from innerspring mattresses in response to movements. This is normally brought about by the springs and coils and result in clunking sounds and annoying squeaking. When it comes to choosing and buying a new mattress, latex is generally regarded to be a better choice than a traditional spring option. While the basic spring model is reasonably priced and a lot of people have them, this type of mattress just does not perform as well as the latex one does. The newer, hybrid coil mattresses that combine springs along with foam and latex, however, can be a good choice for those that want the advantages of both. A latex model may be pricey, but its performance and durability can speak for itself. Needless to say, it will last much longer than a spring model; therefore avoiding the need to replace it sooner. In contrast, going for the high-end all spring model, you are basically buying it for its luxurious cover and materials, which many high end models offer. In the end, however, these often do not offer any more comfort than your traditional low-end spring beds. Nevertheless, spring mattresses are still considerably good; but not as good as the latex mattresses when you compare both. In terms of comfort, latex mattresses are often the best choice. After all, comfort is the top goal of any mattress, right? Additionally, they deliver other benefits that you cannot find in spring mattresses. In humid areas where mold and dust are prevalent, having a latex model is a practical investment. All in all, latex models present more advantages and fewer disadvantages compared to the more common and less expensive spring/innerspring model. This is the reason why latex mattresses have very high owner satisfaction ratings. At the end of the day, everything boils down to your personal choices. Choose a model that will suit not only your wants, but also to your needs. Whether you go for the pricier latex mattress, or settle for the less expensive spring-made ones, or do a combination of the two and choose an exotic latex/foam/pocketed coil hybrid mattress, all that matters is that you have chosen a mattress that will help you sleep the night away.